Simply tell us on our Facebook page @AbsorbineUK in no more than 25 words WHY you like to pamper your horse. Then if you don’t already simply ‘LIKE’ our page. 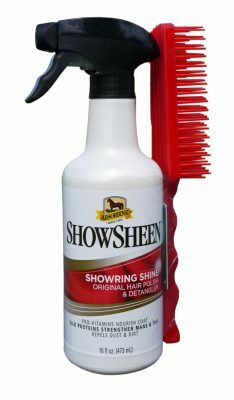 One lucky winner will then be picked at random to receive one of our ‘Goody Bags’, which will include a 16oz bottle of SHOWSHEEN HAIR POLISH & DETANGLER. If we receive over 50 likes, then two winners will be announced, or if we receive over 100 likes, then there will be three lucky winners in total. The giveaway will close at 5pm on the 17th October 2018, and all winners will be announced on our Facebook page @AbsorbineUK on Thursday 18th October 2018. The company reserve the right to remove this offer at anytime and all company T’s & C’s apply.